The internet is filled with people who fondly remember watching various King Kong and Godzilla movies during Thanksgiving break. It’s been that way for awhile, too. I remember being intrigued by references to such marathons on various websites and newsgroups back in the late 90’s. I had been able to piece together that the tradition was linked to the New York area, but exact details were scarce back then. Nobody whose recollections I found ever mentioned how the tradition got started or when it ended. But this year I decided to finally get to the bottom of things. Our story starts in 1955. That’s when General Tire and Rubber purchased RKO Radio Pictures as a way to give General Tire’s television stations a massive library of content. One such station was WOR-TV in New York (which General Tire had obtained ownership of in 1952). It should come as no surprise how King Kong quickly appeared on the channel. It aired on “Channel 9” numerous times a week, including appearances on Million Dollar Movie, in addition to multiple airings on the same day. Surveys quickly revealed how every person questioned had watched one full showing of the film on television and even watched part of a repeat showing! So when the station was in need of something big to rake in lots of Thanksgiving advertising dollars, it’s no wonder they accepted the King Kong pitch made a relatively new employee named Lawrence P. Casey. 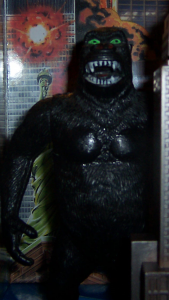 Casey had been inspired by an early Christmas promotion WOR-TV had done called “Christmas with the Kongs.” Although that promotion only showed the original film and Son of Kong, the 1976 debut of the “Holiday Film Festival” was made up of Mighty Joe Young, King Kong vs. Godzilla and Son of Kong. One can’t help but wonder if the use of King Kong vs. Godzilla was some sort of test, as next year’s installment included a kaiju movie marathon on the day after Thanksgiving. Now viewers could scarf down reheated leftovers in between showings of King Kong Escapes, King Kong vs. Godzilla and Godzilla vs. The Smog Monster (with King Kong now playing on Turkey Day). 1978 saw the event being promoted as the “King Kong vs. Godzilla Festival” and the day after Thanksgiving showing Son of Godzilla, Godzilla vs. The Smog Monster, Godzilla vs. The Sea Monster and Godzilla vs. Megalon. The event went through other minor changes over the years until its last hurrah in 1985, when both days were limited to double features. Why did the event stop? FCC woes eventually led to RKO putting the channel up for sale in 1985 and selling it to a “joint venture” of MCA/Universal and Cox Enterprises in 1986, with Cox later withdrawing. This meant WOR-TV no longer had access to the original Kong films. But I doubt the tradition would have survived into the 90’s even if RKO didn’t have to make the sale. The rise of VHS in the 80’s made it possible to enjoy those films at any time and undoubtedly chipped away at the number of viewers tuning in each year. The American television rights to most of the Godzilla films shown during this event would be reverting to Toho by the 1990’s and there would be no guarantee they would be able to reach an agreement with WOR-TV. After all, those films played almost exclusively on cable channels during that time. There’s also the issue of how people would react to Toho’s insistence on using the international versions of the films, which had different titles and dubbing (along with material not present in the American versions viewers were familiar with). There’s also the issue of how the event’s top sponsors, Crazy Eddie and Child World (part of the Lionel Kiddie City family of stores), both eventually went out of business. But King Kong’s connection to Channel 9 did not end when the station changed hands. Not only had being bought out by by MCA/Universal resulted in the station now being called WWOR-TV, but the decision was made to include references to it in amusement park attractions featuring King Kong! “King Kong Encounter” opened in 1986 and included a fake broadcast from the station about Kong’s rampage in New York. This was also the case when “Kongfrontation” opened in 1990. Although WWOR-TV was purchased by Matsushita Electric the same year, the WWOR-TV newscast appears to have been kept in both rides until the closure of “Kongfrontation” in 2002 and the 2008 destruction of “King Kong Encounter” in a fire. Channel 9 is now a MyNetworkTV station and there is a chance a King Kong movie will make an appearance on it again. Judging from my local television listings, MyNetworkTV plays a single movie on each day of the weekend. Given how they seem to focus on films which are relatively recent, there is a chance Kong: Skull Island or Kong’s upcoming rematch with Godzilla will make an appearance on the channel. It won’t be on Thanksgiving, but it would be a nice way of continuing the channel’s connection to the simian superstar. But I doubt few would complain if they decided to make an exception and play a King Kong film on Thanksgiving (along with a Legendary Godzilla movie on the day after). Even if it was a one time event, the sheer amount of publicity and goodwill which could be generated by doing so would be worth it. Given how state specific television traditions like the “Yule Log” and New Year’s Eve marathons of The Twilight Zone eventually spread to channels which could be seen across the country, one wonders why a King Kong marathon wasn’t intentionally replicated by other channels. WOR-TV’s California affiliate apparently gave it a try at one point, but otherwise it looks like only New York, New Jersey and Connecticut were able to get in on the fun. I suspect it’s due to the cost of licensing all the films (and that the other traditions I noted cost much less to recreate). Thankfully people are recreating the tradition at home. It’s also possible for the tradition to be accidentally recreated in simplified form! All it would take is for one channel to play a King Kong movie on Thanksgiving and for another to play a Godzilla movie the following day. It’s not as unlikely as one might think. Last year I saw part of Destroy All Monsters on the day after Thanksgiving. So keep an eye on the viewing guide this year. You never know what might happen!